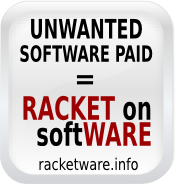 Racketware.info > en > Within Europe: easy legal action! Within Europe: easy legal action! This page is also available in: EN FR, the original version being the French version. A good court decision is one whose arguments can be used on other occasions. In France, with court experience concerning hardware-software bundling since 2006, decisive legal arguments have now emerged. Based on European legal ground, they are valid across the European Union. The hardware is a material product. The sale agreement transfers the full ownership to the consumer. By contrast, for software, the consumer receives only a licence to use the software, provided the consumer accepts the "end user licence agreement" (EULA). The distinction between hardware and software is settled in jurisprudence, at least in France. It implies that the reseller must fully inform the consumer on each product, see below. Because computer hardware and software are two distinct products, demanding the consumer to pay the price for unrequested software is automatically an unfair commercial practice. 29) Demanding immediate or deferred payment for or the return or safekeeping of products supplied by the trader, but not solicited by the consumer except where the product is a substitute supplied in conformity with Article 7(3) of Directive 97/7/EC (inertia selling). That is a subsidiary argument. In France, it is based on article R. 132-1 of the consumer code. Because the value of the software licence is currently not known prior to the purchase, the consumer's request cannot strictly be called refund request but must rather be named request for a compensation . Some manufacturers offer a (rather low) price only upon request after the purchase. Hence, the argument in the previous paragraph can be used to unconditionally discard the manufacturer's estimate. Because manufacturers or resellers usually do not (even in court!) provide a price for the software licence, the judge's decision is based on the public price estimate provided by the consumer.